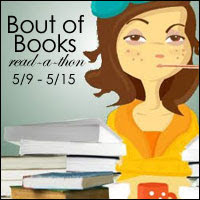 It’s time for #boutofbooks again! YAY! I’m joining this time again, full-on! I actually have the day off tomorrow, so I can spend, most of my day reading! My workdays will be a bit shorter than usual (I work in IT at a school nowadays, and the students still have spring-holiday next week, so there is less need of my services), which also equals more reading time. And next weekend is also delightfully empty and this means EVEN MORE READING OPPURTUNITY! I might go to the sauna on sunday though. Which just means reading while naked. I also have some ebooks I want to finish or dive into, and will continue an audiobook on my commute (at the parts where I can’t read). And now I’m off to bed (after preparing a batch of cold brew to drink tomorrow <3), and really looking forward to tomorrow!